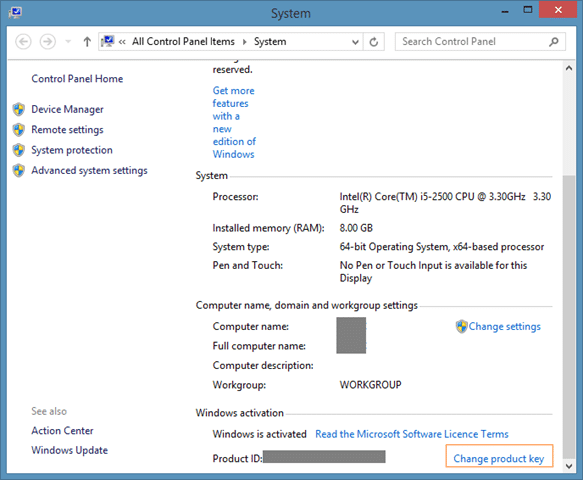 A question that is often asked is “How to change the product key in Windows 8/8.1 operating system?” A user may want to change Windows 8/8.1 product key or product license key for a couple of reasons. 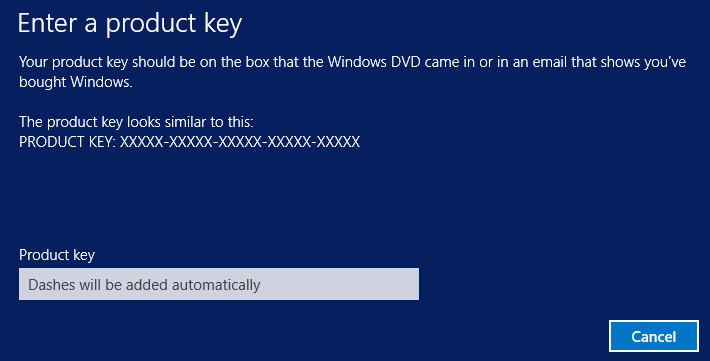 May be you want to use another product key, or may be, you want to activate your newly installed Windows 8/8.1 by replacing the generic key used while installing Windows with the original product key. Tip: Windows 7 and Windows 8/8.1 can be reinstalled without a product key provided that your existing Windows 7/8/8.1 installation has been activated. Whether you want to replace the generic product key with the original product key or want to change your existing key with another one, changing the product key in Windows 8/8.1 is fairly simple and doesn’t take much time. 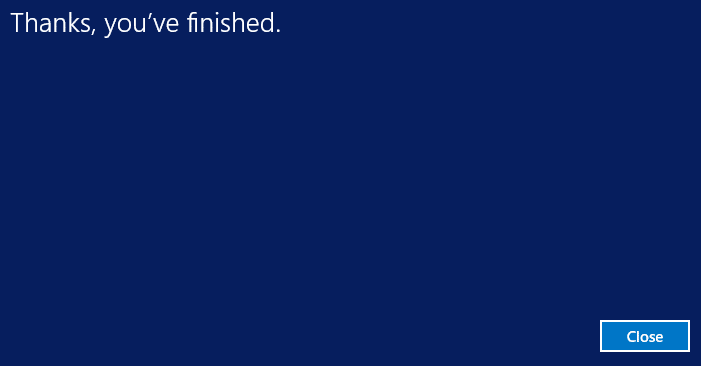 You can follow one of the three methods given below to change product key in Windows 8/8.1. Step 1: Right-click on Computer icon on your desktop and then click Properties, or use Windows and Pause hotkey to open System window. Alternatively, if you’re on Windows 8.1, you can right-click on the Start button and then click System option to open the same. Step 2: Once System window is launched, scroll down to see Windows activation section. 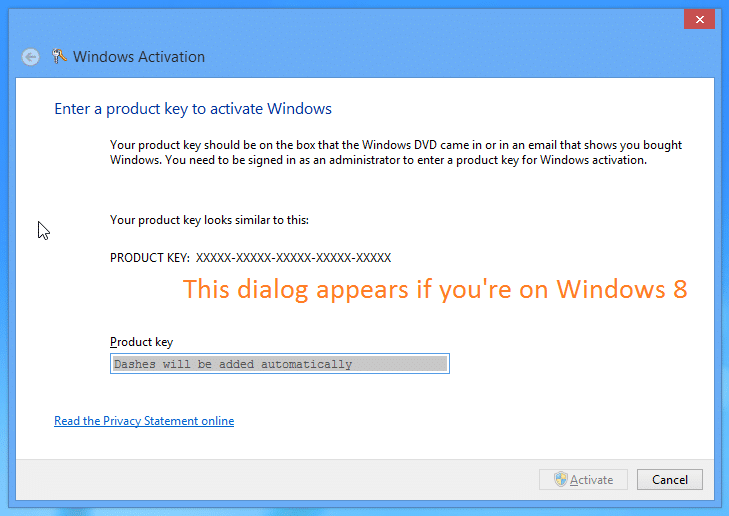 Here, click on the link labelled Change product key to see Enter a product key screen (in 8.1) or Windows Activation dialog (in 8) where you need to enter your 25-character product key and then press Enter key or click Activate button to connect to the activation server and activate your product. This method is very similar to the above one but you’re launching Enter product key screen right from the Start screen. Step 1: When you’re in the Start screen, type Slui 3 to see Slui 3 in the search results, select Slui 3 and then press Enter key. Step 2: Here, enter your 25-character product key and then press Enter key to activate your version of Windows. Step 1: Open Command Prompt with admin rights. To do so, switch to the Start screen, type CMD and then simultaneously press Ctrl + Shift + Enter keys to run Command Prompt as administrator. 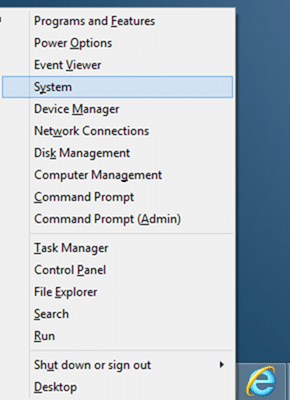 You can also go through our how to run Command Prompt as administrator in Windows 8 guide for step-by-step instructions. Click Yes button when you see the UAC prompt. 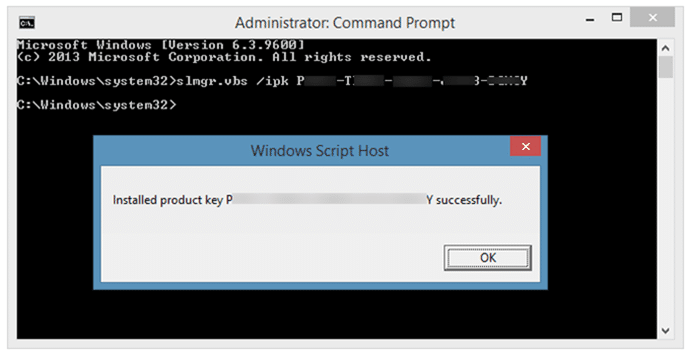 Step 2: In the elevated prompt, type slmgr.vbs /ipk <Your product key> and then press enter key to change the product key and activate Windows using the newly entered product key. For instance, if your product key is 12345 12345 12345 12345 12345, then you need to type slmgr.vbs /ipk 12345 12345 12345 12345 12345 followed by Enter key to activate your Windows 8/8.1. How to recover product key from unbootable PC guide might also help you. If I am not mistaken, you want to change the existing product key with a new one, right? If yes, you can go ahead and change the product key without formatting the drive. Iam going to activate my window 8.1 pro 9600 build for that i have bought new license key. my question is do i need to format the PC or shall it be done without formating by simplying changing the new key (licence original) with the exisiting one ? Note that you have to be online in order for this to work, certainly for methods 2 and 3. If you are not connected to the Internet Windows will just claim the key you entered is not valid, which is rather confusing as what it really means is that it cannot connect to the activation server to check the key.